E&C companies, PMCs, Real estate develepors, Pvt and government organisations executing big infra projects in India like NHAI, IRCON,RVNL,NTPC,DFCC,RITES, MES, CPWD etc. per project per year. 30 days money back period. Unlimited logins & data. 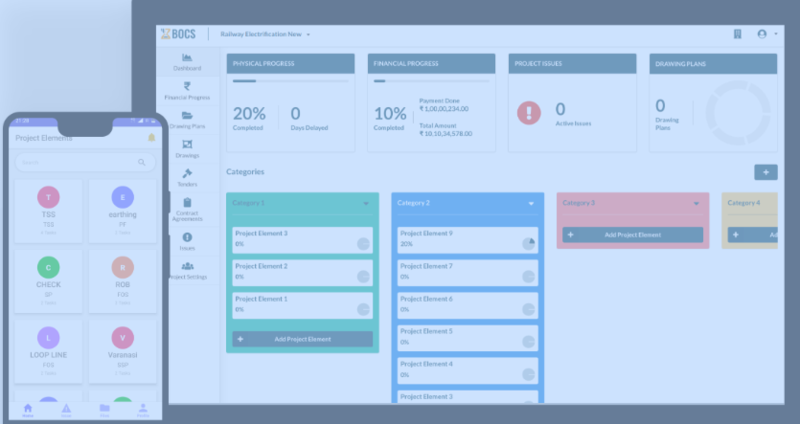 Cloud based construction project management platform. Flexibility in creating project components. Data entry directly from site. Cons: The user interface should be more customizable. User should be able to create project components at all levels but should have option of selecting only those which most important for him to monitor daily basis. Thankyou sir for ur valuable feedback. Our team will be in touch with you to take further suggestions for improving on the shortfalls pointed out. Pros: The clean UI makes it easy for a layman to supervisor to work and collaborate on the same page to make timely decision. Overall: I am involved in project management and bocs make it easy to bring everyone on same page to make better planning and decisions. Thankyou sir. Teambocs is greatful for ur in depth feedback.